ddd 5.1 channel surround sound, dsd converted from pcm 48 khz/24 bit. the poetic significance of risonanze erranti (1985-87) should be interpreted in the light of the reflections developed since the summer of 1975 with the venetian friend and philosopher massimo cacciari, to whom the work is dedicated. 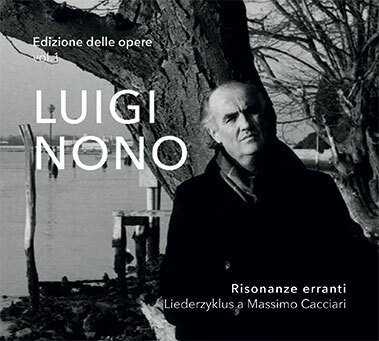 after al gran sole carico d'amore (in the bright sunshine heavy with love) (1972-74) nono, obsessed by a sense of anguish owed to his solitude and his activism frustrated by the stagnation of italian music institutions, felt the need to re-examine his work as a composer, in the gramscian sense of an "organic intellectual in the society". his meeting with the philosopher revived his interest in the critical and artistic activity in the vienna of ludwig wittgenstein's tractatus logico-philosophicus, and more broadly in the mitteleuropean culture between the 19th and 20th centuries, which he perceived as a "higher' commitment to the quest for truth, as opposed to the falsehood of political, scientific, religious, logical-mathematical thought and the misleading implications of language. as regards the past his protest is intensely isolated, reflecting the anxiety of modern man who seeks comfort in the solitude of his own inward space to evade the "storm" and the caducity of time and listen to the "breathing limpidity" of the freedom of the infinite, as in the verses of the seventh of rainer maria rilke's duino elegies, chosen by cacciari and used by nono in das atmende klarsein [the breathing being-clear] (1981), a work that contains in a nutshell the poetics of his production in the 1980s. memory also means listening to the secret link with the lost voices that once sang the truth of sentiments and the strength of their ideals, whose song comes back to life in the "instant', through the multiple forms of a "suspended choir': in this way a "metaphysical" accord occurs within a historicity subtracted from linear time, among the voices of the resistance combatants who were sentenced to death of il canto sospeso [the suspended song] (1955-56), of cesare pavese and giuseppe ungaretti and the song of the franco-flemish, reborn in gesualdo's tears, in claudio monteverdi's lament of arianna and in that of henry purcell's dido; in the farewell of richard wagner's tristan and isolde, giuseppe verdi's violetta and gustav mahler's lied von der erde; in the sounds of nature in mahler and anton webern, and in the voice of his friend bruno maderna. listening to the "instant' for cacciari means "pathema" and "enduring pathema also means [...] following every way, knowing that there are no "ways out", without nostalgia, without solace, but every way..."
in nono an open, anti-dogmatic thinking is under way: it constrains modern man to a condition of wandering, as if the "way endlessly produced the way", in an anxiety that stokes the burning thirst of memory, so that he can listen to the "many voices that live in us" (nono to helmut lachenmann in 1983) and recompose them in the memory of "a face" and the hope of a new "morning" (from pavese's morning).